This 4-in-1 smoke detector comes with a smart back-up battery, but that’s as high as it raises the bar. We gave the Roost Smart Battery high marks when it came to market late last year. Equipped with a removable Wi-Fi module and a tiny microphone, the battery will send an alert to you and as many “watchers” as you care to designate the instant your smoke detector sounds off. Now Roost has teamed with Universal Security Instruments to manufacture a pair of its own smoke alarms. The company sent its most capable model—the RSA-400—for us to review. The RSA-400 looks like your ordinary, everyday smoke detector. The included Roost Smart Battery enables it to connect to your Wi-Fi network, and that’s how it sends alerts to your smartphone if the alarm goes off. But the battery provides only backup power; the Roost Smart Smoke Alarm must be hardwired to your electrical system to operate. That’s because it’s a 4-in-1 alarm capable of detecting smoke, carbon monoxide, the flames from a fast-moving fire, and the presence of natural gas. Most of its competition—including the Nest Protect—lack that last feature, but the presence of all four sensors is why it must be hardwired, according to Roost. That’s fine if you’re replacing a hardwired alarm, but you’ll probably need to call an electrician if you’re replacing a more ordinary model or putting this in a new location. Actually, Roost recommends hiring an electrician even if you’re just replacing a hardwired alarm, but I suspect that caution is at the behest of the company’s attorneys. I’ll describe my own installation experience in a bit. The Roost Smart Smoke Alarm has LEDs to indicate the presence of smoke, carbon monoxide, and natural gas (hopefully not all at the same time). Each Roost Smart Battery you install gets a unique name, so you can tell which alarm is sounding off or which battery needs service (if it loses contact with your Wi-Fi network, for instance, or if it’s nearing the end of its five-year life cycle). Roost tells me the alarm itself can distinguish between the four triggers—smoke, fire, CO, and natural gas—and that it will emit different alarm sounds accordingly: The standard temporal 3 (T3) alarm sound is emitteds when it detects smoke or fire, and the standard temporal 4 (T4) sound when it detects carbon monoxide. A third alarm sound is used in the presence of natural gas. The Roost Smart Battery has an algorithm that can identify these sounds and will let you know which of the four dangers set it off when it sends its text message. I wasn’t able to present smoke, fire, CO, or natural gas to the detector, so I just pushed the test button to set it off a few times. The first time, Roost sent a message that it had detected the presence of natural gas. When I pushed the button again a couple of hours later, it reported the possible presence of smoke and fire. I quizzed Roost about my experience and learned the device was not to blame. I’ll explain why in a bit. 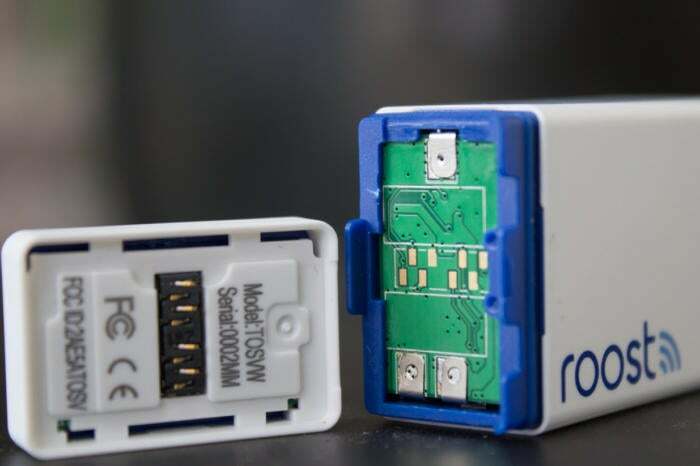 When the Roost Smart Battery wears out, you can detach the Wi-Fi module and connect it to a fresh battery. There will be three wires in the box if you have multiple smoke alarms that are interconnected, as I do. When one alarm in an interconnected system goes off, all the alarms on that circuit will sound off. If, as you should, you put one smoke alarm in each bedroom and one in a common area, there’s a good chance you’ll be alerted to danger no matter which room you’re in or which room the trouble starts in. 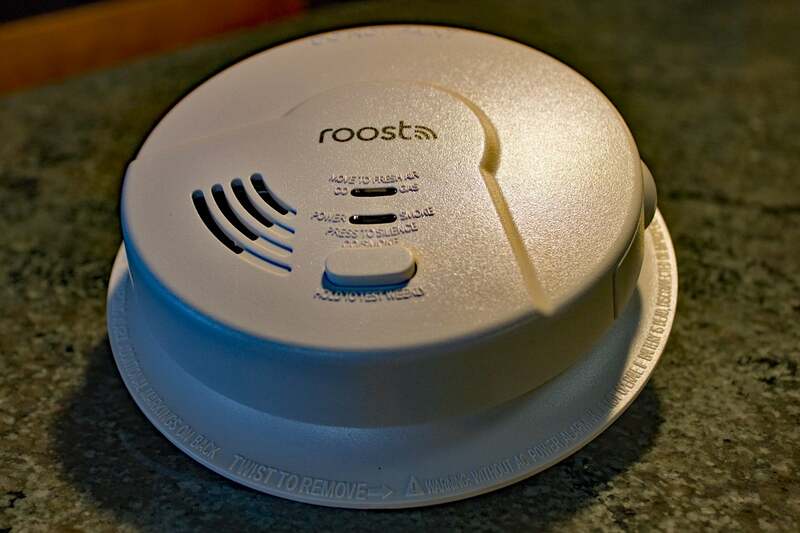 Roost, however, recommends against interconnecting its Smart Smoke Alarms with smoke detectors from other manufacturers. I initially interconnected Roost’s alarm with my five existing Firex smoke detectors. As expected, testing the Roost caused the five other smoke detectors in the system to also fire off. Two of these are installed in bedrooms close to and on either side of my kitchen, which confused the battery’s algorithm because they sound slightly different, and that’s why the app reported different causes for the alarms. 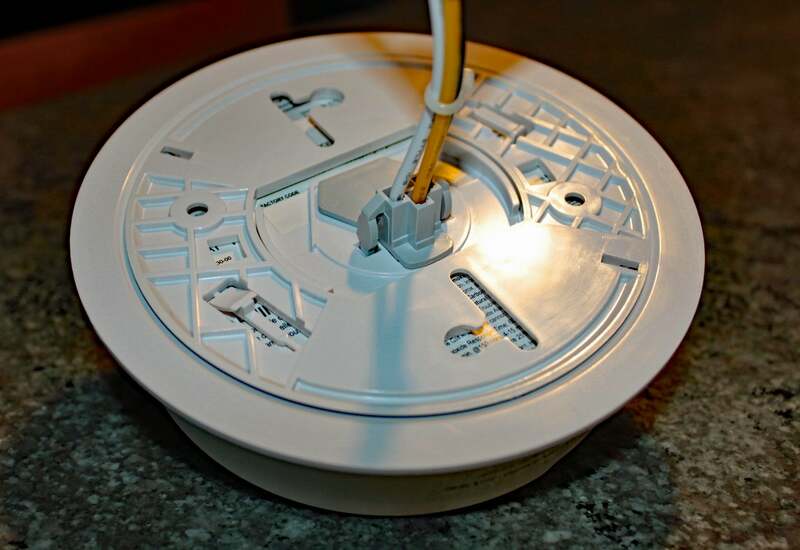 Three wires plug into the back of the smoke alarm. You’ll need to hardwire the other ends of the wires to AC power (the third wire isn’t used if you don’t have interconnected smoke alarms). If you don’t have interconnected alarms, or you don’t want to interconnect the Roost with alarms from different manufacturers, just wrap some electrical tape around or put a wire nut on the Roost’s unused yellow wire before you stuff the wires back into the junction box. Once I did that, the alarm tests consistently reported the presence of smoke and fire when I pushed the test button. This, of course, is thoroughly discussed in Roost’s comprehensive, 35-page, printed user manual (bravo, Roost!). But I didn’t make it beyond page 5, so that’s on me. 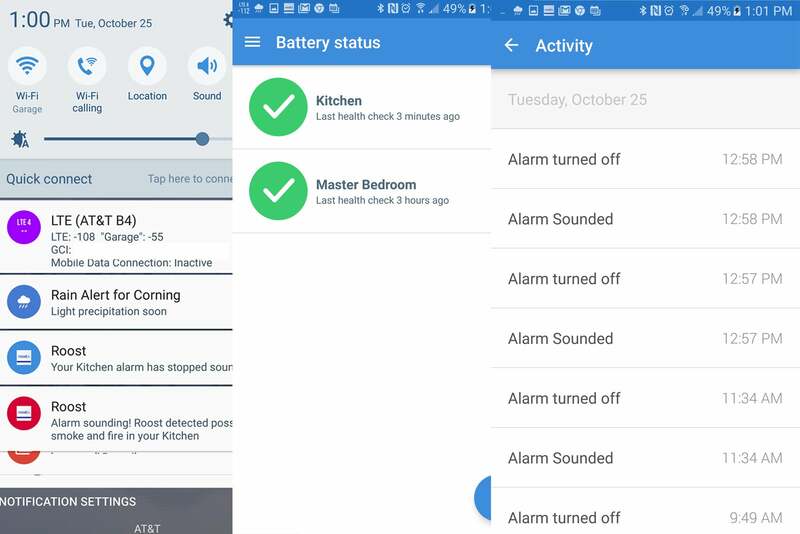 I did, however, encounter one snafu in Roost’s installation instructions, which have you install the smoke detector and then install the Roost app on your phone and pair it with the back-up battery. The app asks for the make and model of the smoke detector you’re putting the battery in. Fine, that’s readily available on the box. But the app also asks for the smoke detector’s date of manufacture, which is printed on the smoke detector itself and isn’t exposed unless you take the detector off its ceiling bracket. Lucky for me, I was curious about the date and looked at it before I installed the detector. That saved me spending 10 minutes trying to line up the tab on the smoke detector with the slot on the mounting bracket. If you buy one of these, make a note of the manufacture before you mount it to the ceiling. The screen on the left displays how Roost alerts appear on your phone. The center screen shows the status of each of batteries you’re using, and the one on the right shows an activity log. 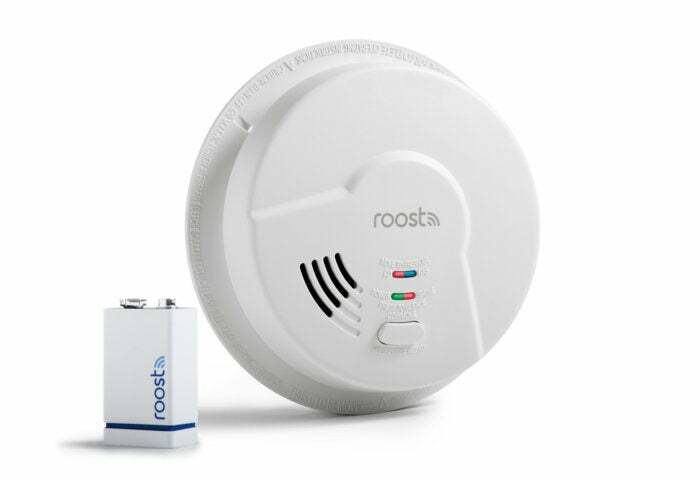 You can put a Roost Smart Battery in just about any smoke detector and get nearly all of the benefits that the Roost Smart Smoke Alarm delivers: Alerts on your phone when the detector goes off, the phone number for your local first responders right alongside the alert, alerts sent to monitors you choose who might be able to take action if you’re not around, and no more 3AM chirps from a dying smoke-detector battery (you’ll get an alert on your phone long before then). But the typical smoke detector can’t detect smoke, fire, CO, and natural gas. As I mentioned up top, Roost partnered with Universal Security Instruments to build the Roost Smart Smoke Alarm. That company’s own comparable 4-in-1 detector (USI model MDSCN111) is $80 MSRP, but you’ll need to buy your own battery. Choose a Roost Smart Battery for $35 MSRP and you’re at $115. So you could say buying the Roost RSA-400 is like buying USI’s detector and getting the smart battery for free. But that’s only if you consider MSRP. At the time of this writing, Amazon was selling USI’s 4-in-1 detector for $45 and the Roost Smart Battery for $25. At $60 for both, you’d be spending $20 less than if you’d bought the RSA-400; then again, this review was written the day before the RSA-400 reached the market. I don’t know where its street price will land. Having said that, with an $80 MSRP, the Roost Smart Smoke Alarm RSA-400 is $20 cheaper than a Nest Labs’ Nest Protect. On the other hand, the Nest Protect is outfitted with a path light to guide you to safety, voice alerts to warn you of danger, and it can be incorporated into a broader smart-home system. That last feature means it can talk to other systems to do things like shut down your furnace if it detects carbon monoxide, turn off your HVAC system to prevent its fan from spreading smoke from one room to another, or trigger your Nest Cam to record a video clip that might show what happened. You’ll of course need to buy additional products to realize those benefits. With Roost, you’ll need to rely on IFTTT to tie it to other smart-home products, and there are only a handful of existing IFTTT recipes. These include ones that will turn on your Philips Hue or Skylinknet light in response to an alarm, and another that will record a video on your Homeboy camera. You’ll find more here, or you can create your own, but Nest is way out in front on this score. Just remember: the Nest Protect can’t detect the presence of natural gas.